In 2004, 2011, and 2017, the Arbeitsgemeinschaft für Neuropsychopharmakologie und Pharmakopsychiatrie (AGNP), a group of German-speaking psychiatric researchers and psychiatrists, published successive versions of therapeutic drug monitoring (TDM) expert group consensus guidelines. The 2017 version has as a major strength its encyclopedic nature, including 1358 references. The guideline has 3 major sections: 1) theoretical aspects of TDM, 2) drug concentration levels in blood to guide neuropsychopharmacotherapy, and 3) practical aspects of TDM in psychiatry and neurology. 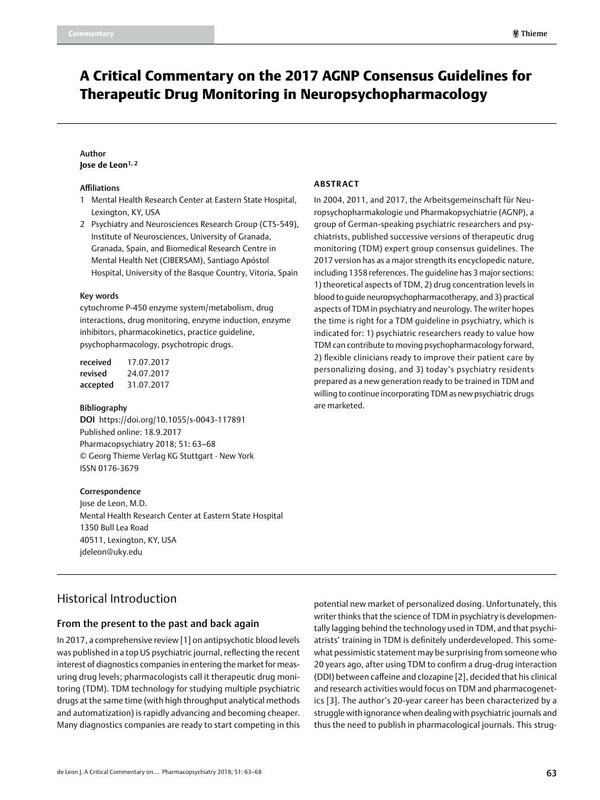 The writer hopes the time is right for a TDM guideline in psychiatry, which is indicated for: 1) psychiatric researchers ready to value how TDM can contribute to moving psychopharmacology forward, 2) flexible clinicians ready to improve their patient care by personalizing dosing, and 3) today’s psychiatry residents prepared as a new generation ready to be trained in TDM and willing to continue incorporating TDM as new psychiatric drugs are marketed. cytochrome P-450 enzyme system/metabolism - drug interactions - drug monitoring - enzyme induction - enzyme inhibitors - pharmacokinetics - practice guideline - psychopharmacology - psychotropic drugs. 22 Schoretsanitis G, Spina E, Hiemke C. et al. A systematic review and combined analysis of therapeutic drug monitoring studies for long-acting risperidone. Expert Review in Clinical Pharmacology 2017; DOI: 10.1080/17512433.2017.1345623.